The monument is remarkable due to its engineering excellence. We can appreciate four walls or graded terraces embedded to the hill, made of irregular carved-stone polyhedrons, brilliantly assembled, and which make up three parallel cultivation terraces. A thick wall (49 feet long and 13 feet high) decorated with four niches erects on the last polyhedron. The stones had been perfectly adjusted. It has four large trapezoidal niches of 6.5 feet on average. In front of the building there was a circular large fortified tower that must have had defense and communication aims. No less striking than the remarkable system of highways were the irrigation ditches which ran for scores of miles in the Central Andes. The height of the mountains, often rising to 18,000 or 20,000 feet, forces the moisture-laden winds coming from the east across the humid basin of the Amazon to deposit their burden in heavy rains on the eastern slopes of the great Andean chain. Little rain ever falls on the western slopes. On fact, one of the greatest deserts in the world is the two-thousand-mile coastal strip extending from central Chile to Ecuador. The soil in the bottom of the valleys that cross this region is rich enough to grow luxuriant crops of sugar cane, cotton, and corn, but it needs to be regularly irrigated in order to do so. For this purpose the rivers, fed by melting snow in the high Andes, are deflected into irrigation ditches which follow the contours of the valleys for many miles. Inca engineers must have had good eyes and a fine sense of grading since they had none of the instruments on which our engineers depend to lay out similar projects. Imagine running a perfect contour for twenty miles! 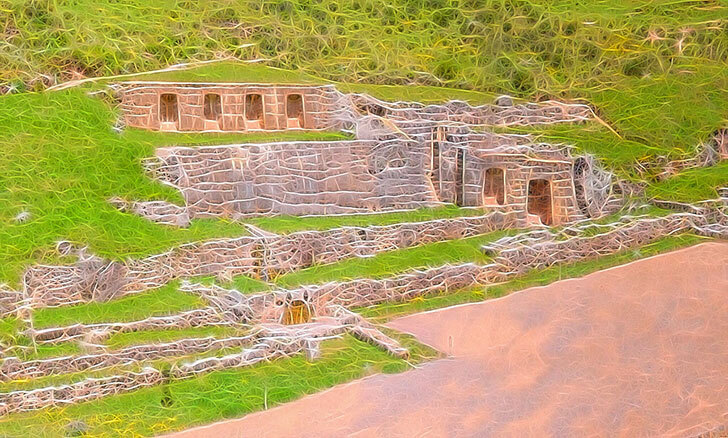 Not only did the Incas provide their fields with necessary water, they also saw to it that their towns and cities had adequate supplies and for that purpose built fine aqueducts.